Riverfront Park is a public park in downtown Spokane, Washington. The 100 acre park is located along the Spokane River containing the upper Spokane Falls and just upstream from the lower falls. It was created for Expo ’74, a World’s Fair event. The defining feature of the park is the Pavilion, which is marked by a 145-foot-tall (44 m) metal frame and wire shell that formed the US Pavilion tent during Expo ’74. 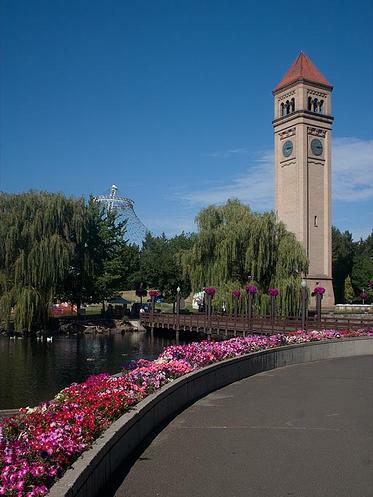 The park is well known for the Riverfront Park Carousel, as well as an IMAX theatre, clock tower, skyride over the falls, a small amusement park for kids, a skating rink during the winter months (home to the Gonzaga Bulldogs special hockey team), and the Spokane River Centennial Trail which passes through it. The Lilac Bloomsday Run Post-Race Celebration in May. 4th of July fireworks display. Pig Out in the Park during Labor Day weekend.